Gayndah is associated with the Triassic Gayndah beds set in a group of variegated sediments with Aranbanga volcanics on EPC 2044. The adjacent lease EPC2265 has part of the Jurassic Surat Basin known to be coal bearing. This lease has not yet been drilled. Coal seams vary from 1m to 10m thick and in some locations there are up to 3 seams. There is a 2004 JORC Inferred Coal Resource of 79 million tonnes at above 6200 kcal/kg GCV. The coal is a dry sub-bituminous coal with high ash content. Recovery tests have indicated that a minimum recovery of 24% by volume of good economic coal product is achievable with minimal processing. Further recovery tests are planned. Easily accessible by road and rail. Next to the town of Gayndah and supportiveRegional and Local Council. An estimation of the Maiden coal resource on EPC 2044 at Gayndah resulted in an Inferred Coal Resource of approximately 79 million tonnes exceeding 6000 kcal/kg. This resource estimation was announced by WAL on 7th November 2013 and relates to JORC 2004 guidelines. 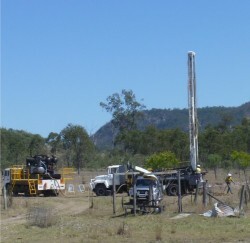 RC and core drilling programs. Landowners supportive. Due to the high ash content in core, samples were sent for recovery tests to Recycoal Ltd in UK. Current results indicate that about 24% is recoverable and a standard coal product can be obtained by minimal upgrading processes.